Kerry Lee Bates with over 100 American White Pelicans (Pelecanus erythrorhynchos) on Grassy Island in background during a Stand-up Paddle (SUP) outing 19 Sept 2010 Morro Bay CA. Six images from Kerry Lee Bates and Mike Baird Stand-up Paddle (SUP) outing 19 Sept 2010. 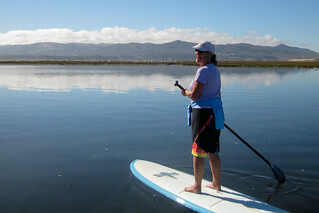 Stand-up Paddle (SUP) Boarding on the glassy calm estuary waters at Morro Bay, CA 9-11AM 19 Sept. 2010 before the northwest winds picked up. Mike Baird and Kerry Lee Bates put in at Coleman Beach at the far northeast corner of the bay, and paddled across to the sandspit and down to Grassy Island where many white pelicans were observed. Dozens of recreational paddlers were out today. SUPing has become the new hot sport. To use this photo, see access, attribution, and commenting recommendations at www.flickr.com/people/mikebaird/#credit - Please add comments/notes/tags to add to or correct information, identification, etc. Please, no comments or invites with badges, images, multiple invites, award levels, flashing icons, or award/post rules. Critique invited.